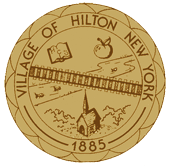 The Village of Hilton shall not be responsible for any property damage incurred while delivering or removing this equipment. This includes driveways, lawns and all other properties where the owner directs this equipment to be placed. Lumber must be under 5 feet in length. Hazardous materials such as asbestos materials, petroleum products, paints, pesticides, batteries or tires can not be placed in the dumpster. *There will be an additional $20.00 fee if used for roofing material. **There will be a $20.00 fee for keeping a dumpster an additional week. emptying the dumpster in between. Dumpsters are delivered Friday and picked up on Wednesday of the following week.